Knockout (also known as Bumpout, Bump, Lightning, Elimination and Putout) is a fun basketball game that a team or a group of friends can play as a way to increase common basketball skills such as free throw shooting and rebounding. The game must be played with a minimum of two players but there is no maximum amount of participants. The only equipment that is needed is a basketball hoop and two basketballs. The objective of the game is to make free throws in order to survive, while at the same time, eliminating the other players. 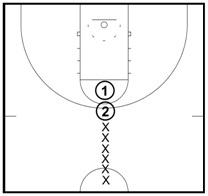 The game begins with all players lined up in a straight line starting at the free throw line and extending towards half court (see diagram #1). The first two players start with a basketball. Player one shoots a free throw and tries to make it. If the player misses, he/she must grab the rebound and score as fast as possible. Player one’s second shot does not need to be from the free throw line. He/she can shoot a jump shot, lay-up or whatever is needed in order to score fastest. Player two cannot shoot until after player one has shot their first free throw. The goal for player two is to score a basket before player one does. If player two misses their free throw he/she must also rebound their miss and make a shot as quickly as possible. If player one makes a basket first, he/she goes to the back of the line (see diagram #2). If player one fails to make a basket before player two, player one is eliminated (all eliminated players stand off to the side until the game is finished). 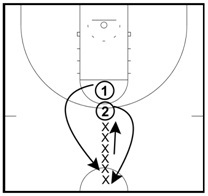 Once player one makes a basket he/she passes the ball to the next player in line. That player tries to make a basket before player two does. If this occurs, player two is out. If player two scores first, he/she goes to the end of the line and passes their ball to the fourth player in line (see diagram #3). The game continues like this until only one player is left standing. One surprise in the game that is different from actual basketball is that players can “bump” or “knock” the ball out of another person’s hands once they have taken their free throw. This strategy is used to make the player chase after their ball and create more time for you to make a basket. One question: If player 2 makes a basket first, then does he/she stay at the front and play the next person, or go to the back of the line? He goes to the end of the line. depends, usually they go to the end of the line, but you can play it as a house rule where they shoot until they get out, as we used to in Pittsburgh, but it is most common for them to go to the back of the line. Another player and I couldn't agree on 1 rule and I couldn't find the answer on any website. If anyone knows the official rules please help us settle this matter. We know that the second player must wait and shoot after the first player but does that stay the same for the third, fourth, fifth, etc.? For example, if the third person ends up with the ball and is about to take their shot from the foul line, can the fourth person shoot before them and knock them out if he gets the ball quick enough or does he have to wait for the third player to shoot first? player 3 cannot shoot until player 2 has shot...player 4 cannot shoot until player 3 has shot, and so on. If player 1 makes their basket prior to player 2 making theirs, they pass the ball to player 3, and player 3 tries to eliminate player 2. follow? 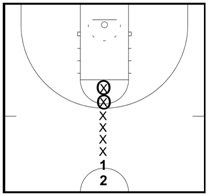 What if player 1 makes the initial freethrow? I just watched a 6th grade girls practice where this was used and I felt it was counterproductive. Players were not using good form and simply throwing the ball at the basket instead of shooting it. I realize it is fun, but I have a feeling that this drill is not going to help them in their upcoming games. Shooting from closer in, such as Kentucky shooting, would have been more effective to have them focus on actually making their shots. It's unclear how this works if you only have 2 players ("The game must be played with a minimum of two players..."). It could be a very short "game"! What if player 1 makes the basket and player 2, instead of shooting the basketball throws the ball to knock player 1's ball further to delay player 3 from getting the ball? There's no rule when this occurs. It should be not be allowed??? I coach a travel team. When we are waiting for the team to arrive, the girls who came early always, on their own, play knockout. It's a fun & competitive game that they enjoy. Question: There are 3 players. 2nd in line knocks 1st out. Who passes the ball to 3rd? I was 2nd and kept my ball. He claims I cheated.